Our spontaneous trip last weekend to the Fuji Five Lakes area proved simply amazing. We had a great time bike-touring for the first-time, and are excited about upcoming plans to visit Hokkaido. This recent trip was a bit of a reprise of another we took early last spring, and was an experiment to see what it would be like to carry our world on our bikes while riding a bicycle. While a few adjustments need to be made, we think we may have a handle on a system that works for us. More details on the trip later, but I did want to share the photo here of a new friend I made while picnicking in Kawaguchiko. At the end of our ride we flopped on the grass by the lake to enjoy some sweet corn we'd bought from a roadside stand near Lake Saiko. We'd bought some the day before on our way to Lake Motsuko and loved it enough to stop again on the return. 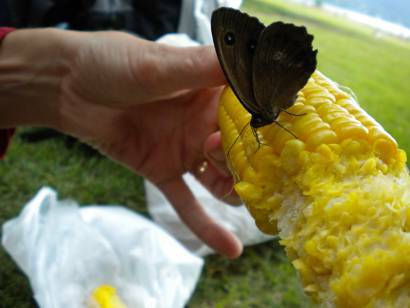 Apparently, this little fellow in the photo with me loves sweet corn, too. While I chomped away on one end, he took little sips from the other. A match made in heaven! Hello! I'm pretty interested in cycling to all the 5 lakes around Mount Fuji. Is there a cycling route for that? Or do you have to know your way around? Hello Anonymous! Sorry for the late response. We were out of town. Ok, here's my answer. There isn't a specific route that I know of, but a good map should do you well. I'd start in Kawaguchiko, and work my way along one side of the set and back again. You may have to factor in some riding along highway, but you may be able to sort out other little by-ways. If you have an iPhone (which is what we used in combination with our map) you'll be able to nip around pretty easily. If you want, you can send me your email in a comment (that I won't publish), and I can give you the full scoop of our trip. Sounds like a fun trip!